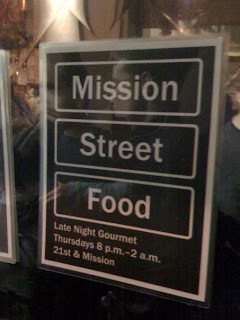 We’re announcing a new format for Mission Street Food: each week, we’ll feature a local guest chef/cook, who will offer his or her own dishes in addition to our regular menu. We’re really excited about this new set-up. We’re inviting all local chefs and line cooks to submit ideas for one or two casual-but-innovative dishes via email to missionstreetfood@gmail.com (click here for details). The guest cook can keep the profits from his or her dish, and the public will get a chance to try something new. Operating indoors will also allow us to keep going through the winter (we’d been planning to take a hiatus for the rainy season), and perhaps more importantly, we’ll be able to serve beer and wine—that means we can maintain the festive atmosphere we had out on 21st, but no one will have to worry about getting a ticket for brown-bagging it. Finally, moving down the street will help the truck’s owners avoid conflict with their neighbors; we want to emphasize that their permits are valid, and we remain on very good terms with them. Ideally, this will be part of an indie cooking movement that will let talented cooks reach the public without the risks of opening a conventional restaurant—and let the public enjoy great food without the costs of dining at a conventional restaurant. Hi, this is Karen, the order-taker at Mission Street Food. Anthony has mentioned how surprised we've been by the popularity of the truck, but as the person out front talking to people, I also want to let you know how much I've enjoyed the feeling of community out there on Thursdays. Last night, we started using names to call out the orders, and I think that's when it really hit me that I've been meeting a lot of wonderful people. As some of you may have guessed, I don't normally work in food service; in my regular life, I'm a grad student, so I spend a lot of time alone with my books, and it's been a real joy to talk with so many new people. We've had a lot of favors done for us this month (our friends have cooked with Anthony in the truck, bought more ice for the cooler, run to our apartment for more post-its, and on and on), but above all I want to thank everyone for making it fun. You have made me love San Francisco even more than usual. It looks like another beautiful day, and we will be at 21st and Mission at 8, with more flatbreads than ever. Thanks for your continued support. As usual, there were some obstacles to overcome while starting up for the night. Among other things, the deep fryer fell and broke, so the pre-warmed oil was lost. Anyway, sorry if it took us a little while to get rolling--we're still happily amazed to see so many people enjoying our food. It was particularly gratifying to see so many of you take a chance on the brownies with brie. We thought we'd hear a lot of requests to omit the cheese, so we didn't bring a ton of it--but next week, the brownies will be filthy with brie. Also next week, we're switching to Benton's Bacon, notable for its intensely smoky flavor. Benton's:Regular Bacon :: Bacon:Pork. Mission Street Food had another busy night in its second week. We got a little faster, but we also had more people, so the line was still pretty long. I’ve come up with some ideas for speeding things up, and I’m looking forward to trying them out next week. I think we can shorten the wait time by 50%, but given that we’ve been opening the door to a line of 30+ people, it seems like some waiting may be unavoidable, especially early on. Incidentally, wait times were under 10 minutes after 10:30.
a. in response to positive feedback, we’re going to make the Asian Pear Slaw a semi-permanent offering. b. The potatoes in the King Trumpet will be a little less salty in the future (so feel free to add bacon). c. I wasn’t fully satisfied with the cookies baked earlier in the day, so next week the dessert will be brownies (hopefully involving molten chocolate). If you are interested in being a guest chef at Mission Street Food, please email us with the information below at missionstreetfood@gmail.com. As a guest chef, you should buy your own ingredients and prep 3-4 dishes on your own, with some exceptions (both to the number of dishes and the amount of help we can provide). Same-day prep can be done at our kitchen, but as much prep as possible should be done in advance and presumably in a commercial kitchen. Money earned from your dish will be yours to keep, less 20% for shared costs. For example, if you sell 50 orders of a $10 dish, you will receive $400 to cover your time and food costs and we will use the other $100 to pay for overhead. We will staff the front of the house and will also have one or more cooks available if you need help serving your dishes. We will donate our profits to charity and you can decide whether or not to donate a portion of your proceeds to a charity of your choosing. Creativity is encouraged, and our typical menu items are substantive small plates. Please refer to our blog for an example of past menu items and prices. Also bear in mind that the kitchen will be shared and that space and time are often limited, so your dishes should have a fairly quick and/or easy pick-up. The kitchen has four small burners, three deep fryer baskets, a wok, another pot of boiling water on a wok burner and a small oven (can fit a 6" hotel pan or half sheet).